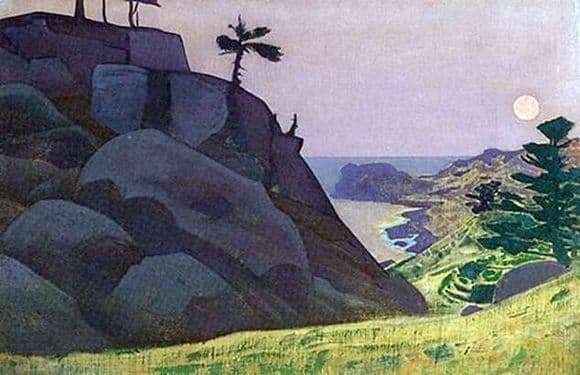 Roerich was very fond of nature, it affected his work and in his words. He said: “Keep it simple and love nature!”. In each of his paintings you can see this love for all the forces of nature. This picture depicts a very simple at first glance landscape, which becomes harder the longer it takes to look at it. It makes you think about something of your own, without taking your eyes off the opening magic look. The foreground shows a large elevation of stones. Most likely, this is a natural rock, as if collected by the hands of huge giants. A set of huge boulders, stacked one on another, form a hill of dark gray-blue color. At the very top of this elevation sprouted several stunted, but incredibly tenacious trees. Each of them has gone through many difficulties in order not to die in these difficult conditions of the rocky terrain. There is a small process in the distance from the surviving trees. It is difficult to understand – this is a fresh shoot or the stump of a once-existing tree that has already been broken, but it attracts attention. In front of the rock there is a yellow-green glade, it resembles autumn in golden-green grass. A small tree grows in the distance, seemingly a true giant compared to the plants that grow on the rock. Further, behind a tree, the view of the sea slightly illuminated by the setting sun opens. The bay, which is somewhere on the horizon of a dark blue color, is closer to the shore of a pink-white color. And the sky above all this is a delicate pink color, virgin, as the beginning of a good fairy tale.